A dynamic Mac DVD copy program that can help you make a backup of your DVD 5 and DVD 9 movies bypassing DVD copy protections. Why Choose DVD Copy for Mac? Besides copying DVD to DVD for backup, you can also save your DVD movies onto your Mac's hard drive with multiple options. You can copy DVD to Video_TS folder, ISO image files or .dvdmedia files. In this way, you can play your favorite DVD movies on your Mac without the disc having to be inserted! Some flexible settings are all at your hand. 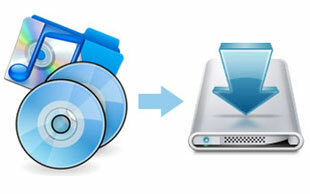 While copying a DVD disc, you can set the copy speed and copy quality according to your needs. Meanwhile, you can select the optical DVD drive to copy your DVD if there is more than one driver connected to your Mac at the same time. Aimersoft DVD Copy for Mac comes with an intuitive interface. You know how to finish you task the time you get it: simply insert your DVD disc into your Mac's hard drive and click the Start button on the main interface to start copying your DVD to a blank disc. No learning curves at all!